We begin this volume with Prince Valiant going on his most daring, and perhaps most dangerous, quest yet: winning back the heart of Queen Aleta. Of course, things don't go as planned as Aleta's rival suitor organizes a deadly search party for the gallant Valiant. Back in Camelot, the troubled Zanedon reveals himself to be a runaway groom as the mischievous twins, Karen and Valeta, hide him in their stable. Prince Arn quenches a coup, Val ends a tyrant's reign with tough love, and domestic chaos runs amok when a poet with a wandering eye makes the Misty Isles his playground. 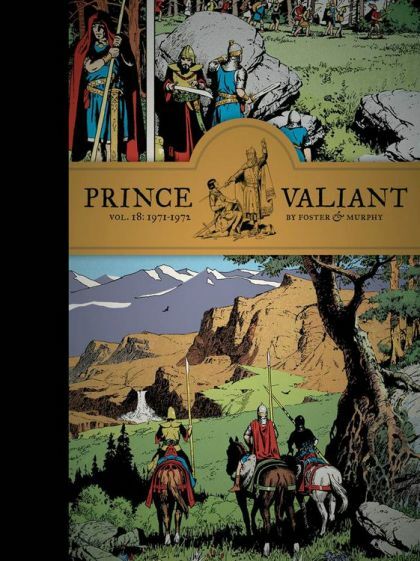 This volume also includes and introduction by Mort Walker and Brian Walker, and a gallery of miscellaneous Foster Prince Valiant cartoons, including one that hasn't been reprinted since 1955, and one that has never been printed before. These are a rare glimpse into Foster's humorous side; they were done for a variety of venues, including the National Cartoonist's Society, Christmas cards, and private commissions-all funny, all Prince Valiant.